Every child knows that a shoe has to fit. 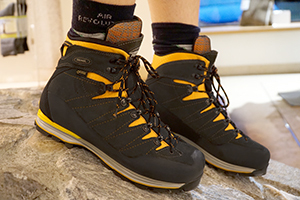 Especially on walking trips and in the mountains, a shoe that fits perfectly makes a significant contribution to the fun of the trips – or it can also spoil it completely. Here are some tips on the correct way to try on boots and how to break them in. Bring the socks with you that you will be wearing on your trip. 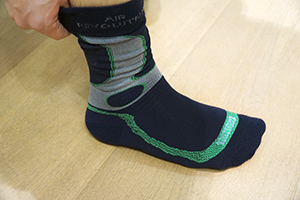 Technical socks that provide an ideal foot climate – particularly in GORE-TEX® boots – are suitable. Important: Socks of different thicknesses not only make a clear difference in the volume but also in the length of the boot. If you do not have any suitable socks, ask to borrow the correct socks for trying the shoes on or, best of all, buy some. If you wear orthopaedic insoles, you should bring these with you when buying boots and try them out in the boots! The first priority is to tighten the boots correctly. Push your heel back, centre the tongue, and lace up. Be aware of the 2-zone lacing when doing so! 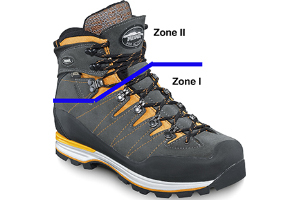 When walking up mountains, lace the lower area up to the locking hooks (Zone I) tightly, and the ankle area above rather more loosely, in order to increase ease of movement (Zone II). 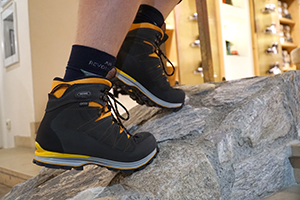 When walking down mountains, mainly tie the laces on the ankle area tighter in the area of the bend (DiGAfix®) in order to prevent the foot sliding forwards. Do not insist on your presumed boot size. Also try on alternative sizes! Your boot size is not fixed. Your feet are smaller in the mornings. In addition, the muscles deteriorate with age, the arch is reduced, the foot becomes longer and wider, and thus larger. In cases of doubt, buy the boot that is slightly larger. Does the heel fit? Can you stand comfortably in the boots? Does the boot fit well regarding the volume? Do your toes have enough room? The following rule of thumb applies: In a boot that fits, the foot has around 1 cm of space at the toe (test with a finger). Many boots are purchased that are too small. Do they pinch anywhere? The width can be stretched and/or will adjust with time when broken in – but not the length! But boots that are too large and, primarily, too wide are not good either. 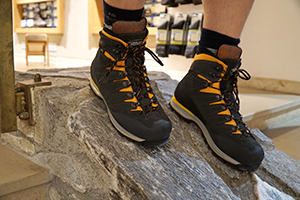 Always try on both boots and use the test route available in the shop. And above all: Take your time. The boots that you presume to fit should remain on your feet for at least 10 minutes, because the leather and the interior, such as foam, will warm up and adjust. When walking up mountains, it is also a matter of how the heel fits, which you can adjust with the lacing. The feet must have a bit of air, but if you slide up and down in the boot then you will get blisters. Lace the boots tautly, primarily in the areas of the front of the foot and the instep. Make very sure that your toes do not touch the front. The more difficult the terrain you are walking on, the more laterally stable the boots must be. You can also try this out on the test route. In cases of doubt, Lukas Meindl recommends the more stable boot. Boots become softer over time and a stable boot will noticeably relieve the muscles. This also prevents tiring and thus pain in the area of your sole. Also wear the correct socks when breaking in boots. It is important that the tongue is in the correct position right from the start: centre it and lace it up as well! The tongue must not slide to the side from the start, otherwise it will never return to the correct position. Lace the boots correctly; for breaking in, do not lace too tightly at the top of the ankle. You can divide the lacing into zones. Lace the upper hook from the top to the bottom. The laces will then run down together. 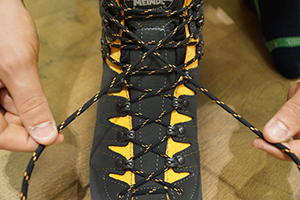 This lacing variant is more pleasant and provides the same stability with more freedom of movement. If you want to play safe, you should initially wear your boots at home, then when out for a walk or on short trip, and only then climb your “personal Everest”. If they are still pinching a bit – walk through dewy grass. The moisture will soften the leather and adjust to fit more quickly. A shoemaker can also help regarding the width.